How is Nokia differentiating its first Windows Phone 7 device from the competition from the likes of HTC? Unique services. At Nokia World, the company has unveiled three services it is adding to the Lumia 800 – turn-by-turn navigation, a music service and an ESPN partnership for sports news. 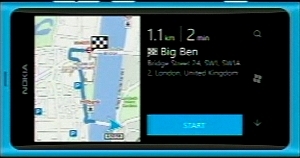 Nokia Drive comes with the Lumia 800 – turn-by-turn navigation for free, making it the first Windows Phone device to offer this. Nokia Music – a music service that offers ‘Mix Radio’, a way of streaming mixes of music from multiple artists. Mixes can be downloaded for playing offline, and can be launched from a live homescreen tile. Finally, it’s launching ESPN Sports Hub, providing a wide range of sports news for multiple sorts and teams. League or team news can then be pinned to a shortcut within the app for easy access. Find all our NokiaWorld coverage here.